There have been many Ip Man films over the years, but lately the number seems to keep increasing. While Herman Yau’s two Ip Man films attempted historical accuracy, most of the rest tend towards embellishing the life of this legendary figure. Ip Man’s story presents a unique opportunity to delve into a time period in which Hong Kong was going through a lot of change and dealing with a lot of outside influences. These Wilson Yip and Donnie Yen collaborations have spent time concentrating on the “foreign devils” that caused so much strife. But it wasn’t only the fact that Hong Kong was now a British colony still reeling from world war two, as a lucrative port city there was a growing class gap between the rich business owners and the less well off struggling to survive. The Ip Man Donnie Yen portrays in this trilogy is the protector of the poor and innocent who seemed constantly threatened by rich foreigners and the those that served them. 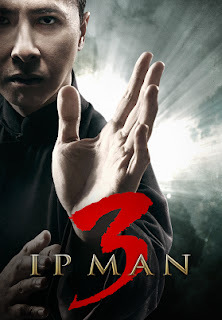 For the most part “Ip Man 3” is concerned with Ip Man’s neglect of his family in order to deal with bigger threats in his community. It makes ample time to allow him to right the wrong of this neglect. Despite the vast amount of action packed martial arts sequences there is a very emotional human drama at the heart of this film. In fact the first half of the film has Ip Man forced into a fight to protect his son as well as the school (and all the rest of the kids that go there) from a rich businessman threatening to shut down the school. The latter half splits its time between Ip Man lovingly giving much needed attention to his wife, who is dying of cancer, and Ip Man defending his school of Wing Chun against another Wing Chun master who wants to take the title of Grandmaster away from him. The obvious problem here is that those sound like two different films. And they may have made two solid films had all of these plots been more properly fleshed out in two separate films. Having them jammed together in one film could work, but it doesn't here as well as it could have. It's too poorly paced and strangely intercut. What is described as its central storyline involves a fairly poorly developed property manager played by Mike Tyson, who fights Ip Man over the right to take over and shut down the school his son attends. Yet both Tyson’s character and his motivations are very poorly defined. He does, however, make for the most challenging fight of the film for Ip Man because of his sheer size and strength that threatens to overpower Ip Man with every punch. As lackluster and generic as this storyline is, it does give us three excellent fight sequences: the aforementioned fight with Tyson’s boss character, and two separate but equally excellent fights against henchmen who threaten both Ip Man himself and his family. Even if the villain is lackluster there is some real emotional weight to the fights Ip Man chooses to involve himself in, but that’s another point in favor of this film. Ip Man is a slightly reluctant hero. He values the moral high ground, being pure of heart and setting a positive example for the children of the neighborhood above all else. However when push comes to shove he can’t stand back while thugs threaten his family and his neighborhood. Perhaps unexpectedly, this storyline runs out of steam and ends long before the end of the film. The second half is dedicated to Ip Man and his dying wife intercut with a competing Wing Chun master’s ambitious plan to challenge Ip Man for the title of grandmaster. While one of these subplots carries a lot of emotional weight the other carries very little weight at all and feels entirely superfluous. A better film would have done a better job fleshing out the first storyline while finding ways to integrate the storyline with Ip Man’s wife in a meaningful way. There are a few subplots that get lost in the shuffle as well. One involves the Hong Kong police losing their ability to effectively protect their city while the British chief of police schemes with the villain. As interesting as this culture clash could have been, very little comes of it before it disappears entirely. The acting is pretty solid for the most part except for Mike Tyson. He sticks out like a sore thumb here. His acting is often hit or miss and when he’s not speaking English, he says a few words or phrases in what is likely broken Cantonese. His presence forces other actors to test their language skills with some broken English. It’s clear that Tyson’s character understands Cantonese but doesn’t speak much of it, and his Hong Kong cohorts understand English but don’t speak much of it. However Tyson does pull of the one fight sequence he's given. The film's most redeeming quality, aside from the moving family drama, is the fight sequences. They're some of the best from Ip Man trilogy. They aren't as brutal as those found in "The Raid" films, nor as experimental or inventive as "Rise of the Legend" from earlier this year, but they make this film worth the price of admission.